Can you believe it’s June already?! And you know what that means….FATHER’S DAY IS ALMOST HERE! Do you know what you’re getting Dad? If that question causes you to panic, grab a paper bag and hear me out…you are not alone! 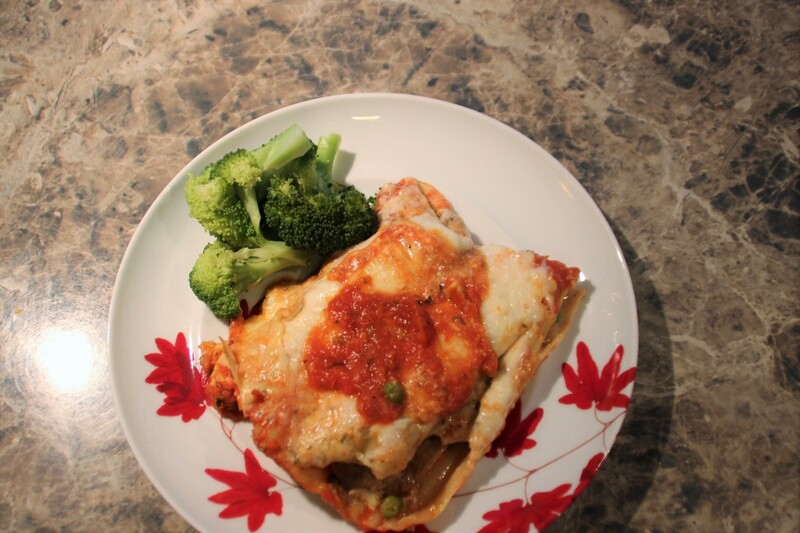 Ok breathe, because Janie-Jean did a little research on what Dad’s really want for Father’s Day and it is something YOU can totally pull off…a delicious day of eating! I am hear to say YES, YES YOU CAN! So I have took it upon myself to come up with some delightful recipes that are approachable, decadent, and oh so delicious! Today we are going to start off with breakfast! You have got to start the day off right and there is no better way to start the day than with Quiche. Well watch and learn my friends because I believe that yes, Quiche can be manly and worthy of a masculine day such as Father’s Day. Especially when it’s stuffed with layers of Pulled Pork BBQ. Think you can handle that? Let’s begin our journey with a delicately, flaky crust. If you want to up your pie making game with practical skills for several different pie doughs and fillings along with successful recipes that allow wiggle room to let your freak flag fly GET THIS BOOK! Ok, now I am going to show you how to make one of her pie doughs using my handy food processor. The first key component in making pie dough is CONFIDENCE! If you approach your kitchen with any sort of anxiety, that emotion will transfer to our ingredients. Pie dough may seem intimidating but girlfriend let me assure you that NOTHING is impossible…YOU GOT THIS! Now where were we? Ah yes, now that we have our ingredients we need to get them ice cold… even your tools (the colder the better).. colder = flakier so I let my ingredients hang out in the fridge or freezer for about 30 minutes to an hour including my food processor bowl and blade. 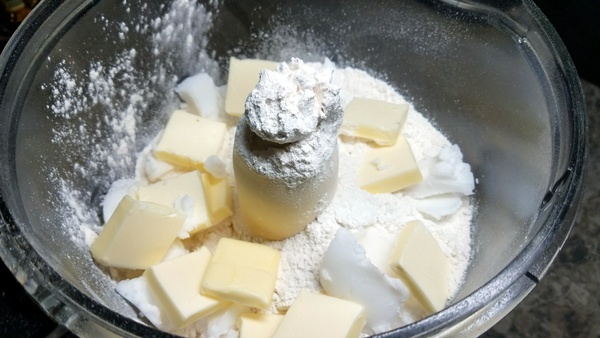 Once everyone is frigidly cold, dump flour, salt, butter, and leaf lard into the bowl of your food processor. Pulse 15 times till it looks like little pea sized flakes of sand. Add 4 tablespoons of ice water pulse 10 more times. Add 4 more tablespoons of water and pulse until the dough just begins to come together. Pour the dough onto a floured surface and split in half. Gently press both halves into chubby discs, wrap in saran and pop in the fridge for a little rest… it’s so hard to be pie dough (insert heavy sigh)! After an hour roll out one disc of pie dough on a lightly floured surface to about 12 inches in diameter for a 9 inch pie. 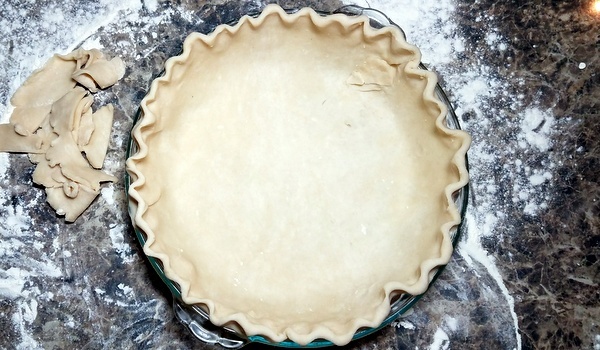 Place the rolled dough into the pie plate, gently press it in and crimp the edges. Allow the pie shell to hang out in the fridge for about 30 minutes. Just enough time to prep the oven and filling. The star of today’s quiche is pulled pork. It’s a great leftover recipe for those moments in your life when you have ample amounts of pulled pork in the fridge. This happens more often than not so I am always looking for ways to use it up. For a great pulled pork recipe the Pioneer Woman has a fantastic one. Take about 2 cups of leftover pulled pork and dress it to your taste with your favorite barbecue sauce. 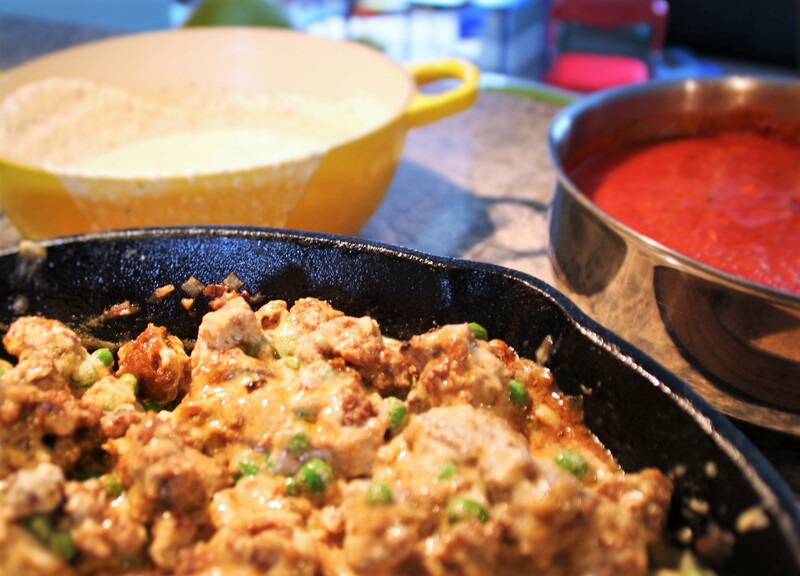 Being a Cincinnati girl myself I had to use our staple, Montgomery Inn Sauce…. So good! 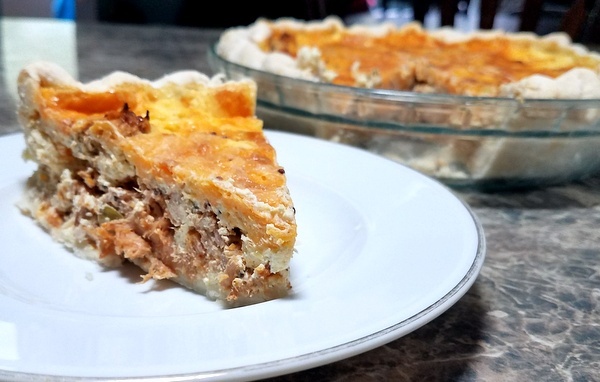 The other key ingredient to this quiche is the super rich sour cream custard which is the perfect companion to the pulled pork. All you need is eggs, sour cream, heavy cream, whole grain mustard and a dash of nutmeg. Hallelujah! This custard is rich, velvety smooth with a little zing from the mustard… it’s knee buckling good. Now that we have the two main components and a preheated oven we are ready to assemble and bake! The layers go pulled pork, sliced scallions, extra sharp cheddar cheese, custard Bake! 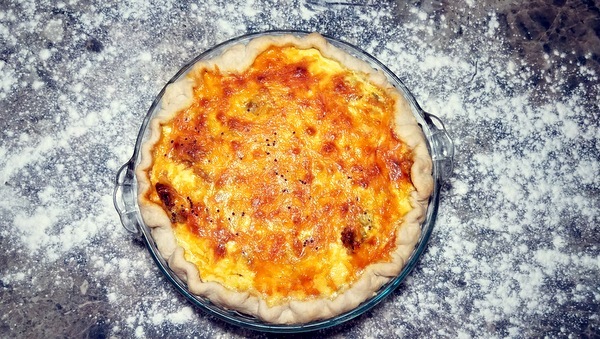 The quiche will bake for about 40-45minutes in a 350 degree oven. You really want the final product to get golden brown and set in the middle. If you have to let it go longer, allow to bake in 5 minute increments till you achieve the final result you desire! The rich custard is the perfect vehicle for the zing of the BBQ dressed pork flecked with the subtle hints of onion and sharp cheese. If brunch were a father’s day tradition, this would be a show stopping main course… heck you could eat it all day long! But in all honesty dad deserves more doesn’t he? So be sure to tune in later this week for a smoking’ hot dish dad will give rave reviews… Loaded, Smoked Twice Baked Potatoes. Yes, you read that right….and I’ll see you Wednesday! 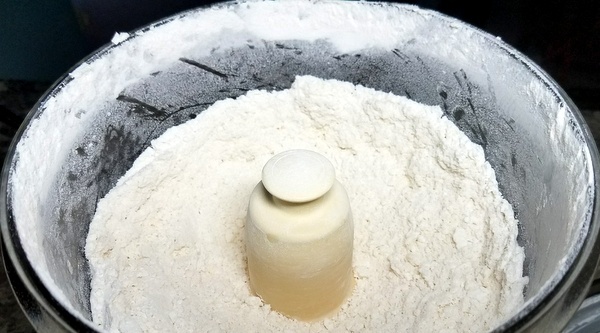 To make the pie crust: Place flour, salt and fat into the chilled bowl of the food processor. Pulse 15 times till the butter and leaf lard are worked into the flour to form crumbs the size of peas and oat flakes. Add in 4 tablespoons of ice water. Pulse 10 more times. Add 4 more tablespoons of ice water. Pulse 5 more times until the dough just starts to come together. 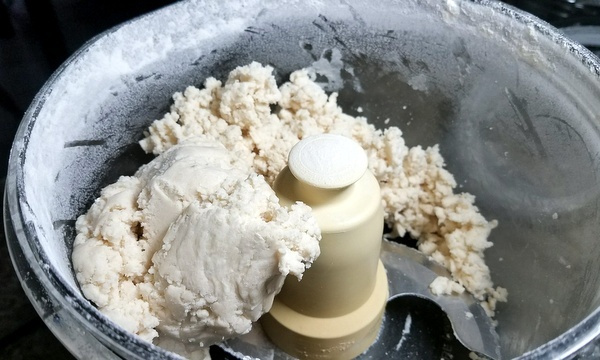 Turn the dough out onto a lightly floured surface to finish the dough off by hand, forming two equal sized “chubby discs.” Wrap well in plastic wrap then place in the fridge to rest for about an hour. Carefully lay the pie into the pan and gently press into the pan allowing the excess pie dough to hang over the sides. 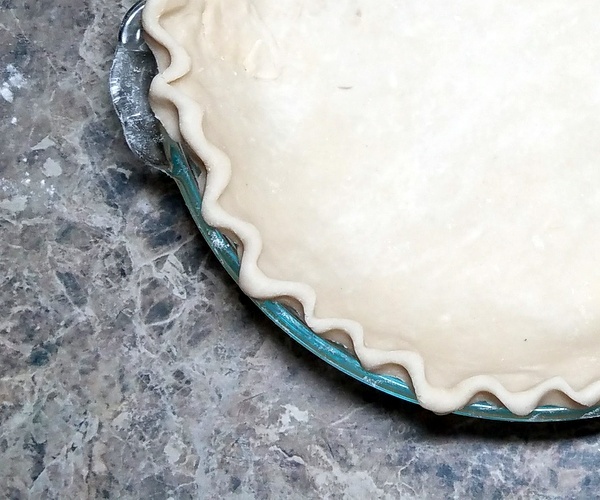 Go around and trim the excess pie dough so that only about ½ “ -1” excess hangs over the edge. Take the excess and fold it under so that it is between the pie pan and the pie dough. You will want the edge of the pie to be slightly above the pan. If at this point your dough seems a bit warm or hard to work with allow to chill in the freezer for 5 minutes. 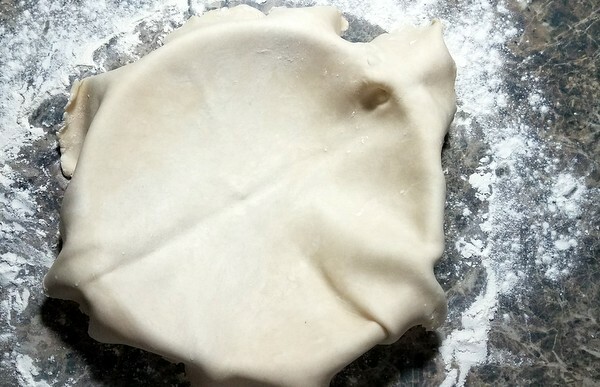 Crimp the edge of the pie by taking the knuckles of your pointer and middle finger on your right hand and the tip of your thumb on the left and press keeping the dough edge in between the knuckles and allowing the tip of the thumb to press and pinch to form a crimp. Repeat till the entire pie edge is crimped. 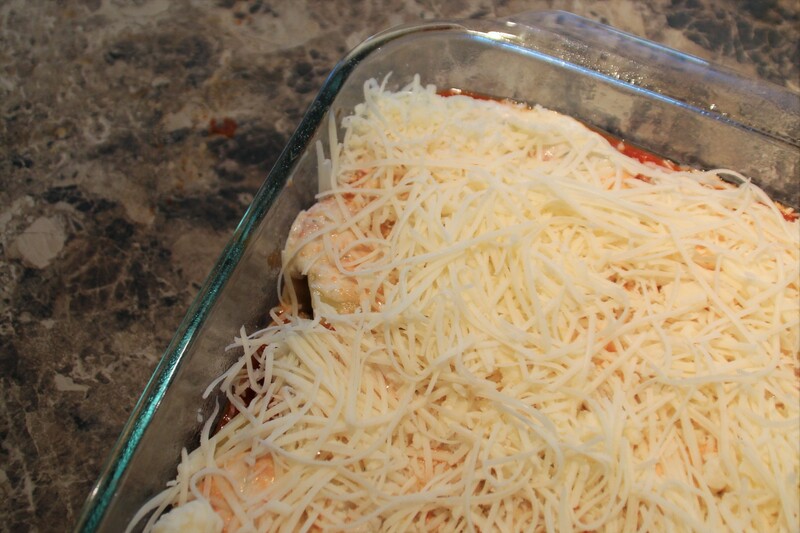 Place in the freezer for about 10 minutes while you prepare the filling and preheat your oven to 350 degrees. For the filling: Dress your prepared pulled pork with your favorite BBQ sauce to your taste preference. I only used about ¾ cup but if you like it saucier then go ahead and add more. 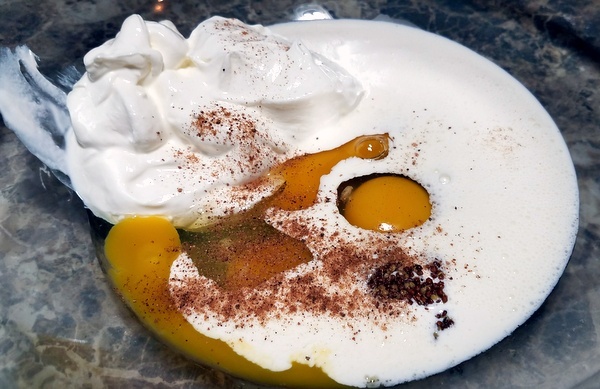 In a separate bowl prepare your custard by whisking the eggs, sour cream, cream, mustard, salt, pepper, and a dash of nutmeg. Whisk until thoroughly combined. 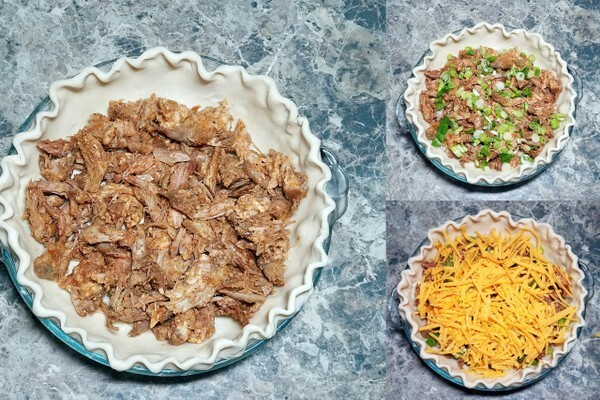 Once the pie crust has finished chilling in the freezer layer the filling in the following order: BBQ pulled pork, scallions, shredded cheddar cheese, and then pour the custard all over the filling. Bake in the oven for about 40-45 minutes until the top is golden brown and the center is set. If you need to cook longer please do until you have a golden brown top. 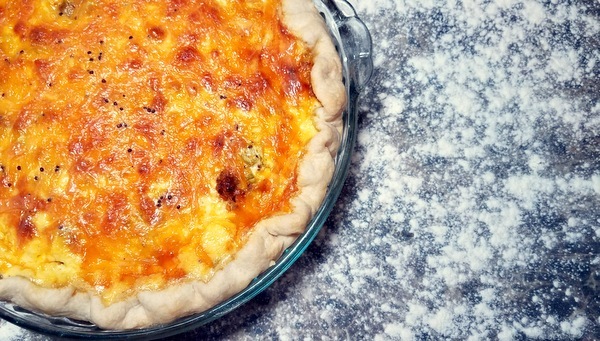 Allow to sit for 5-10 minutes so the quiche can cool and set before digging in! Welcome to Day TWO of the Janie-Jean Flavor Savor! I can’t wait to get this ravioli train rolling! 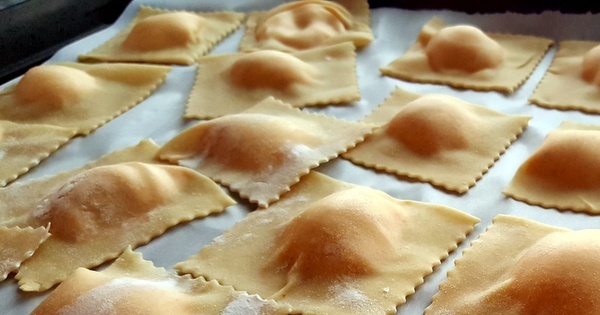 Yes, friend it is EASIER to buy your pre-packaged “Ravs” at the grocery store to prep for your family dinner, but might I offer the argument that the ravioli is the PERFECT vehicle for reinventing leftovers? It’s as easy as taking last night’s meat and potatoes, whirring them briefly in the food processor with a few staples in your pantry and VOILA! They’ve transformed into a delightfully, oozy filling ready to be disguised in an envelope package. Your family won’t believe their eyes…or tastebuds! You don’t even have to make the pasta dough from scratch. The won ton wrappers found in the refrigerated area of the produce section would work great as well. Done and done…out of excuses. Put the kiddos down for a nap, roll up your sleeves and let’s get to work! Mama’s making ravioli! In this scenario we have leftover roasted butternut squash plus a few pantry staples- cottage cheese, parmesan cheese, garlic and thyme. Pulse the ingredients till it forms a smooth filling. 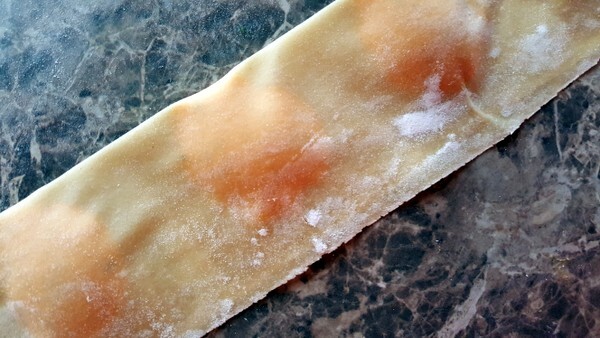 *TIP- You don’t want a stiff filling, but rather one that will slightly ooze when you cut into your ravioli. 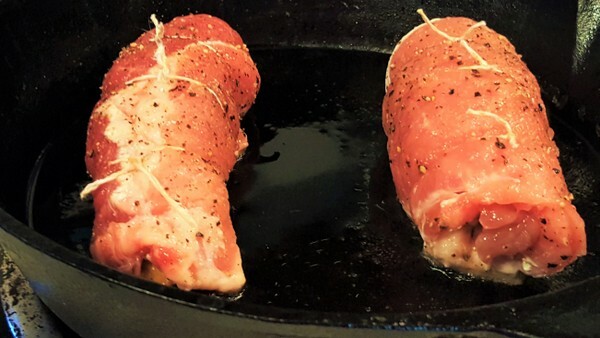 If you’re filling seems a bit stiff, or starchy add in some Extra virgin olive oil to get that consistency. 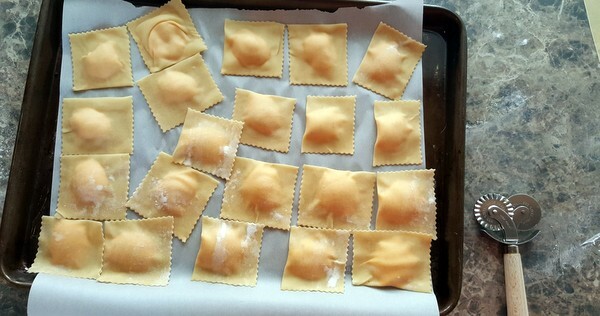 Ok, so the filling is ready to go and you’re like…”Ok girl, but I don’t want to spend hours tediously filling these dang raviolis”…AH I hear you and I see you, so here’s my favorite “life hack” for filling raviolis as well as stuffing any other pastas- use a piping bag or a large zip top bag. Just fill the bag, zip the top, cut the tip off of the bag so the filling can easily transfer onto the pasta sheet. Filling pasta has never been easier. 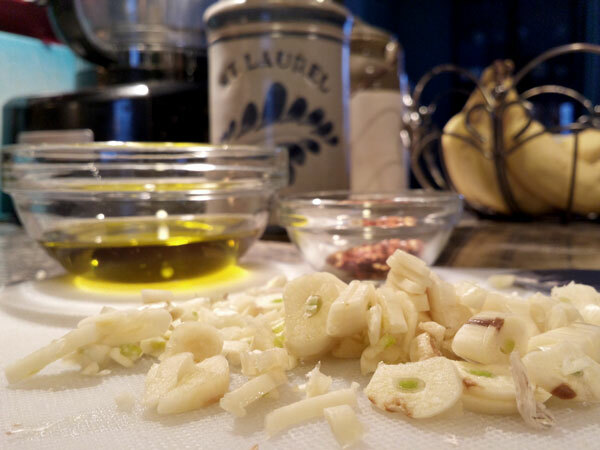 This seriously, has changed my pasta stuffing game! 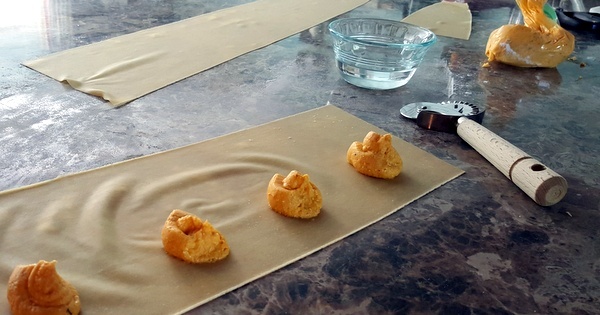 I would pipe about 1-2 teaspoons per ravioli, wet around the edges of the pasta sheet, then place a second pasta sheet on top and press to seal the filling between the sheets making sure to get rid of as many air pockets as possible. 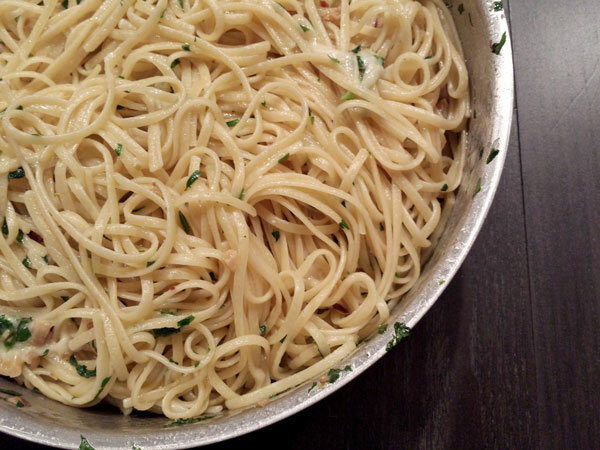 Use a pasta cutter o give a nice finished edge if you want to get fancy! Repeat until all the filling has been used. What I like to do is place the ravioli in a single layer on rimmed baking sheets then place in the freezer. Once frozen, I can store the frozen ravioli in a freezer storage bag to save for later and use only what I need for tonight’s dinner. When it comes time to make the ravioli all you have to do is boil in salty water until they float. Once the ravioli floats cook it for one more minute. While they cook, make a quick brown butter sauce with walnuts, zest and juice of an orange plus 2 sprigs of rosemary. Toss in your cooked ravioli so that each one is covered in the prepared sauce. Would you look at that, Leftover night will never be the same again! High five! And Bon Appetit! 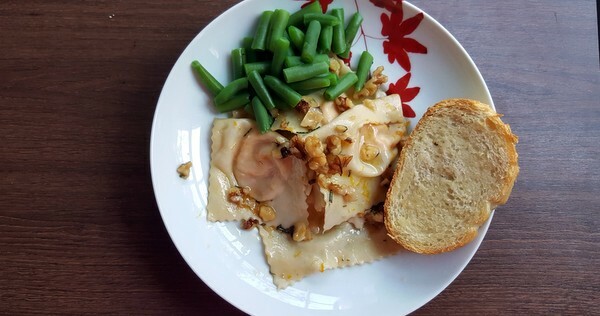 Ravioli is a great way to use up those leftovers. 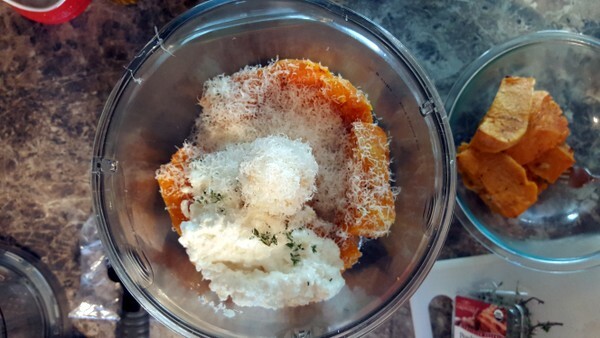 Add the butternut squash, cottage cheese, parmesan cheese, garlic, thyme, salt and pepper to the bowl of a food processor. Puree until smooth. 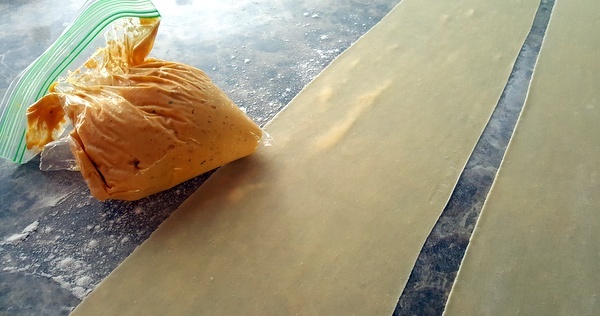 Fill a pastry bag or plastic zip top bag with the filling, snip the corner off of the bat and use to pipe about a teaspoon of the filling in the center of the pasta sheet. Dampen the edges of the pasta sheet with water. Take another pasta sheet and cover the filling. Pressing around the sides to seal the ravioli. 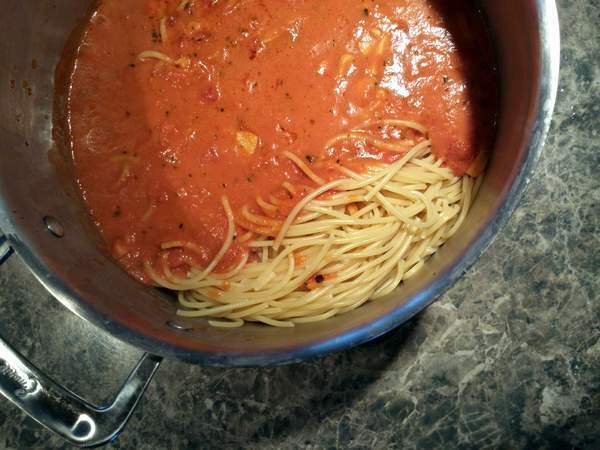 Use a pasta cutter to cut down to size. Place on a floured, rimmed baking sheet till ready to use. 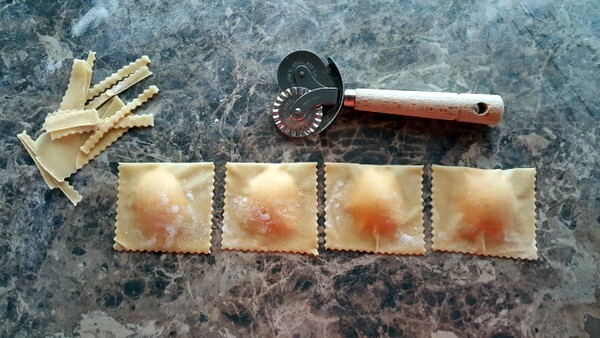 Once ravioli has been assembled, bring a pot of water to a boil. Season to the salidity of the sea. Add Ravioli to the boiling water and boil until they float. Once they float, cook for 1 minute longer. While the ravioli are cooking make the sauce by melting the butter over medium high heat in a sauce pan large enough to hold the cooked ravioli later. When the butter is finished foaming add the walnuts and saute until golden brown, about 2 minutes. Once the ravioli are finished cooking, scoop from the cooking water using a slotted spoon to the saute pan as well as the juice of half an orange. 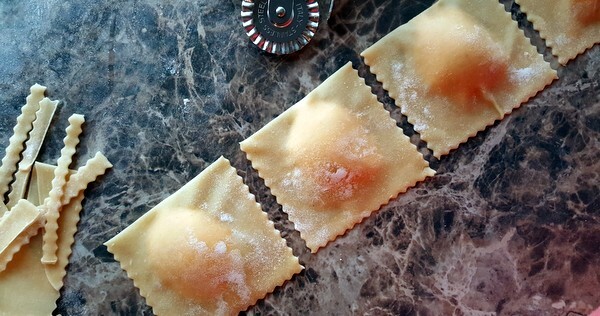 Toss once or twice until the ravioli are covered evenly with the browned butter. Remove the pan from the heat, sprinkle with the rosemary and orange zest and divide among four shallow bowls. Spoon the sauce evenly over the plated ravioli. Hello dear friends! Today marks the beginning of a new mini-series I like to call Janie-Jean’s Flavor Savor! This series will highlight one ingredient or flavor in three separate posts featuring different ways to cook them. Some recipes will be traditional. Some will be a little outside of the box. And then there will be some featuring my favorite ways to eat! My hope for this series is for you to find new ways to shine in your kitchen. We all get stuck in a rut sometimes, so let’s brainstorm and come up with new ideas and share them with our community of home cooks. Are you up for the challenge? 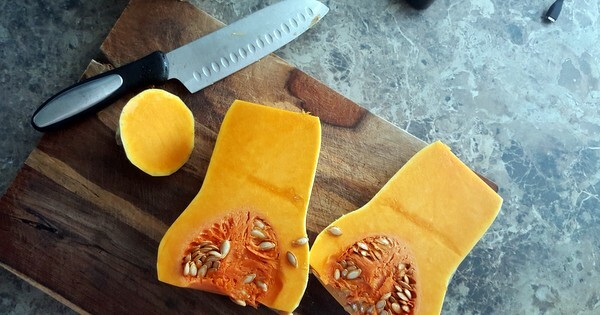 This week’s featured ingredient is…BUTTERNUT SQUASH! Why? You may wonder…well it’s in season. This particular squash is so versatile. And as you will witness this week, this particular squash can be savory and sweet. Today we are going to start with my favorite way to eat Butternut squash…or in this case sip. We are making Butternut Squash soup with apples and homemade, herby, cheesy croutons! 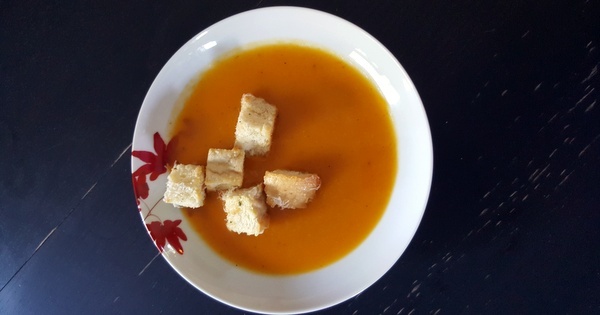 Butternut Squash soup, for me, is that quintessential fall flavor. It’s delicately sweet with notes of savory depending on how you like to season it. 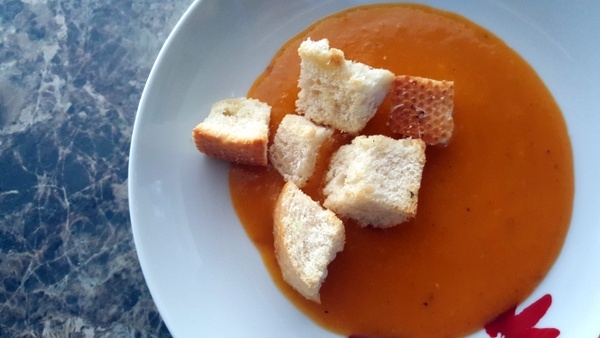 Today’s soup is made even sweeter with apples and balanced with the saltiness of the homemade croutons. Let’s begin! First we are going to create the base of the soup’s flavor by sweating some onions in a large dutch oven over medium heat until the onions are very tender. Then we’ll add diced butternut squash, diced apples and some chicken stock to the mix. When it comes to chicken stock, I would typically buy it from the grocery store; however, this time around I decided to go wild and make my own stock from a simple recipe thanks to smitten kitchen. After experiencing how simple and delicious it was I don’t think I can go back to store bought. Home made stock and store bought stock have a different consistency and while both finished products will taste fine, I found I enjoyed the consistency of the home made stock way more. Regardless, “you do you”…choose your own adventure. If you want to stay with what you know right now that is totally fine. Now where were we…OH YEA! 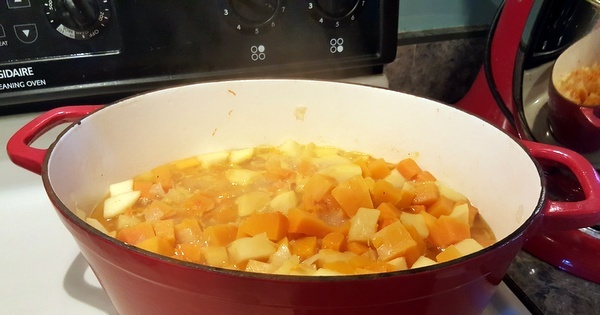 Cook the squash, apples and stock covered in the dutch oven until very soft. Meanwhile, let’s make the croutons. Cube some crusty artisanal bread and lay out in an even layer on a rimmed baking sheet. Drizzle with olive oil, sprinkle with sage and salt then toss to coat evenly. Then go ahead and bake in the oven until lightly golden and crisp. Shred some parmesan on top of the hot croutons. Toss to coat evenly then set aside for later….BOOM! Croutons! 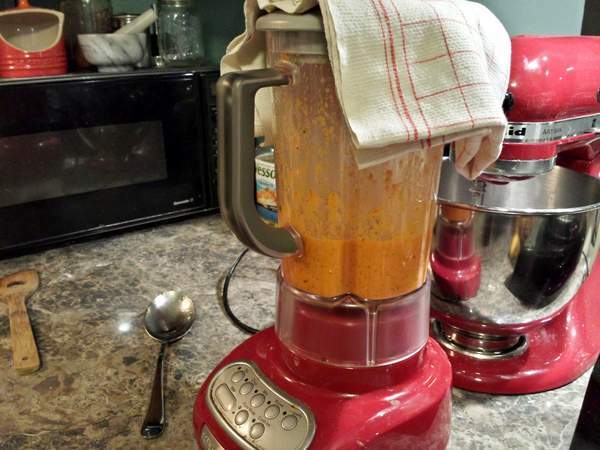 When the squash and apples are tender, it’s time to puree them using an immersion blender. If you’re like me, and you broke your immersion blender from too many soup purees….or just don’t have one at all. Never fear, just use a blender or food processor and puree in batches. The point is we want our soup to be smooth and creamy. Do whatever you got to do to make that happen! Return the puree back to the pot as well as another cup or two of your chicken stock to reach your desired consistency. Finish the soup by seasoning with salt, pepper, nutmeg and cayenne pepper. 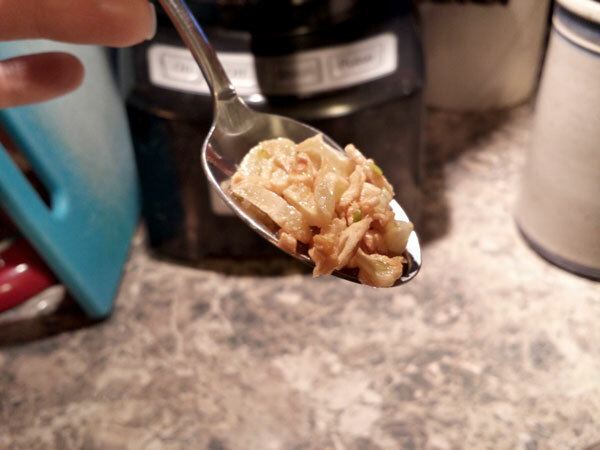 Pour into bowls garnish with croutons and enjoy sipping (or slurping) your new favorite taste of fall! The Butternut Squash is velvety smooth and the sweetness is heightened by the apples. 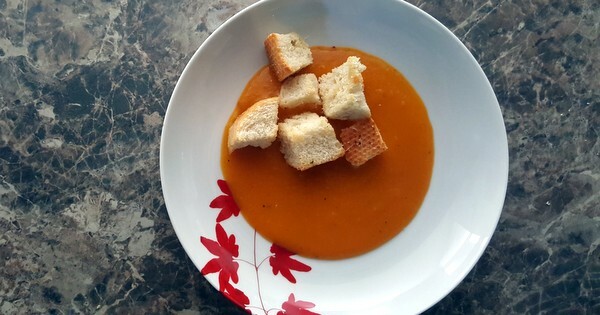 Plus the croutons you readily made make the soup feel special and comforting! SWOON! A recipe like this is a great reminder of the deliciousness of simplicity. No fancy bells and whistles here…just seasonally, good food! Tune in next time for a more challenging take on BUTTERNUT SQUASH…the Ravioli! I already can’t wait! See you Wednesday! In a heavy bottomed stock pot of dutch oven heat the olive oil over medium. Add the onions and cook until very tender. This should take about 10 minutes. Add the Squash and apples to the pot, then stir in 2 cups of the chicken stock. 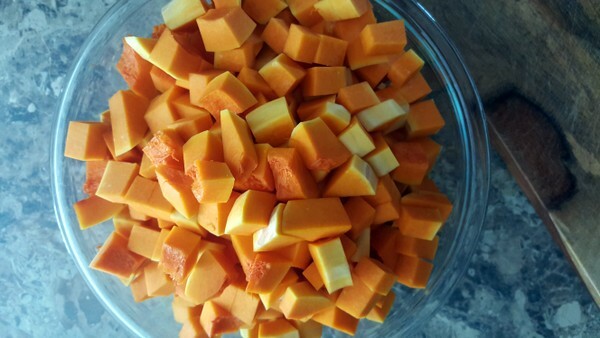 Bring the pot to a boil, reduce to simmer, cover and cook until the squash and apples are very soft- about 20-30 minutes. 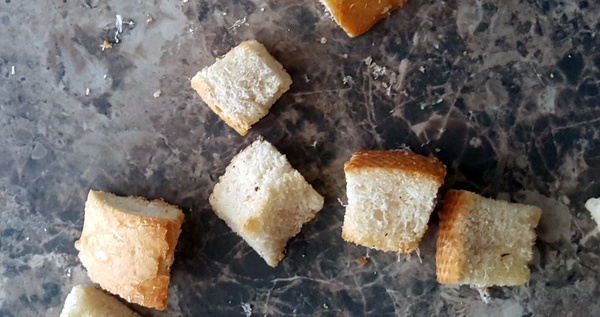 Meanwhile, prepare the croutons by placing the bread cubes on a rimmed baking sheet. Drizzle with olive oil, sprinkle with the sage and salt, then toss to coat evenly. Make sure the bread cubes are in one even layer then bake in the oven until lightly crisp and brown about 10-12 minutes. Sprinkle with Parmesan cheese, toss to distribute evenly then set aside until ready to serve. 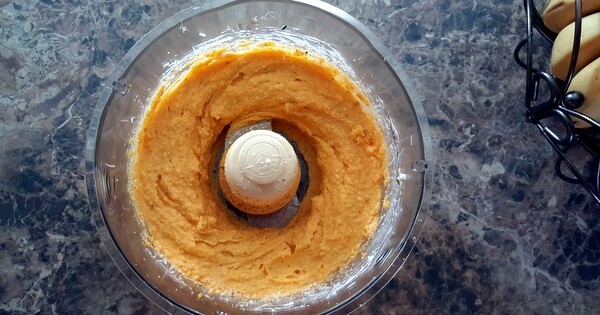 When the squash and apples are tender, puree the soup until smooth using an immersion blender or in batches using a blender or food processor. Return the puree to the pot, add a cup of the remaining chicken stock then stir adding the final cup of stock until the desired consistency is reached. Season with salt, nutmeg, black pepper and cayenne. 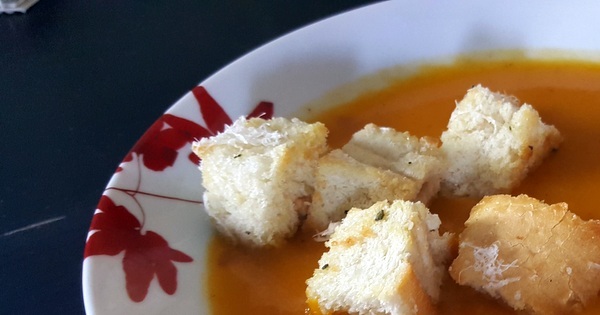 Serve hot, garnished with the sage croutons. Enjoy! I watch a lot of cooking shows. Like a LOT of cooking shows. If we still had cable you would see me Saturday morning curled up on the couch with my favorite cereal, eye guzzling as many food network show as I can like they were Saturday morning cartoons- old habits die hard! Thank goodness for Netflix. And if you’re in the market for a binge-worthy food show you MUST watch “Worst Cooks in America!” Seriously, I think out of all the food shows I have watched, I have learned the most from this show. I may go on a limb and say this show has inspired me the most as well. Now before you start questioning my abilities let me explain. Two chefs (one usually is Anne Burrell) go head to head training the worst cooks in America they can find through a series of cooking boot camp. They go over knife skills and basic cooking techniques. They really drive home the importance of creativity as well as organization in the kitchen. Plus you get a few laughs in on the way because these people are freaking hilarious! 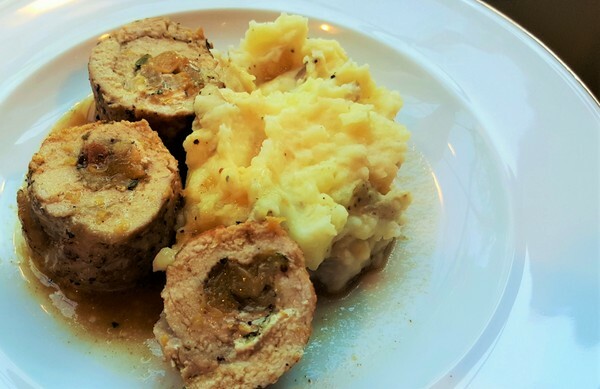 Today’s dish is inspired by one of the episodes where they taught the recruits to make a Roulade with a pan sauce and mashed potatoes. I have had some Pork loin chops in my freezer for a while and have been eagerly waiting for the opportunity to use them. I confess, pork chops are not my favorite piece of meat, but there was a sale and well you know how it goes. I kept wracking my brain for ideas of what to do with these beauties and then it was like a light bulb of inspiration came on in my head while watching Anne Burrell pound the dickens out of a pork loin, prepping to roll around her filling. I followed suit and decided to base my filling on what we had in our fridge. Today’s main players are zucchini, peaches and goat cheese. I added some herbs for flair, and a pinch of cinnamon to add to the “wow factor” of the dish. You could totally substitute any of these ingredients to adapt to what you have in the kitchen. My suggestion is to just think- what’s in season? What do I have? Will it taste good together?…and also, less is more! The roulades finish off in the oven to cook all the way through, then they need to take a rest on the cutting board while we use the brown bits in the pan to make a sauce. I used chicken broth to deglaze the pan. I always thought deglazing was a good way to get a jump start on the dishes. Allow the broth to reduce by half and then add a squeeze of lemon plus the zest because you paid for that lemon so use it all girl! 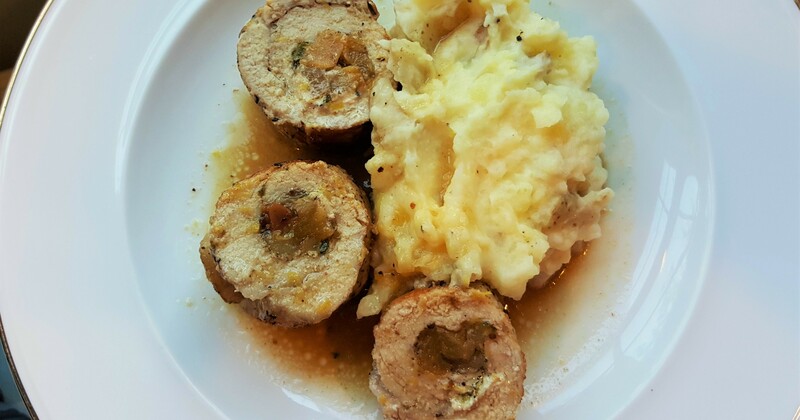 Roulades are sliced into four equal sized medallions, served up right so you can see that beautiful filling and nestled in a delightfully fluffy, cloud of garlic mashed potatoes. Drizzle some of the pan sauce on top to add that final splash of flavor. And voila! Dinner is served! I think Chef Anne would have been proud of this dish. The juicy, seasoned pork against the warm, slightly sweet filling, followed by the tang of the goat cheese and the zing of lemon in our sauce definitely would have earned me a red apron to stay another week. Ok recruits, it’s time for you to put your spin on this dish! Let your creativity sing and let me know what you would fill your roulades with in the comments below! 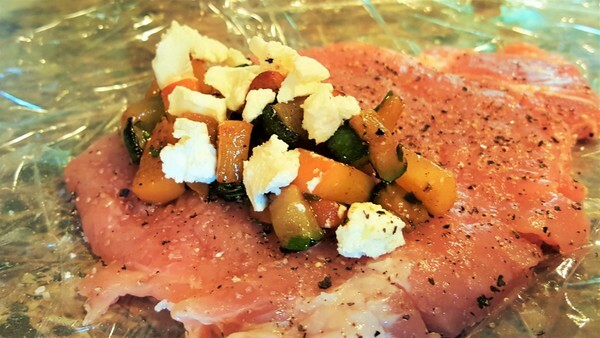 Cover each Pork Loin Chop with some plastic wrap. 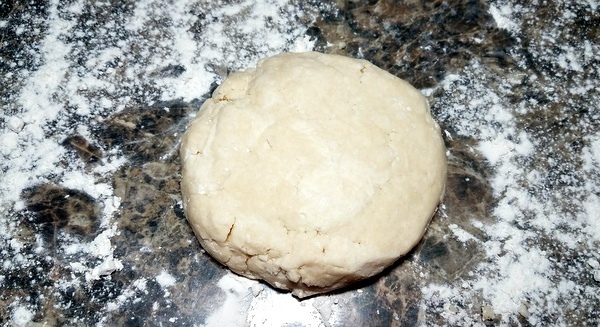 Using a mallet or rolling pin, pound the dickens out of it till it is flattened to about a ¼ inch thick. Season both sides generously with salt and pepper. In a skillet over medium high heat drizzle some olive oil. 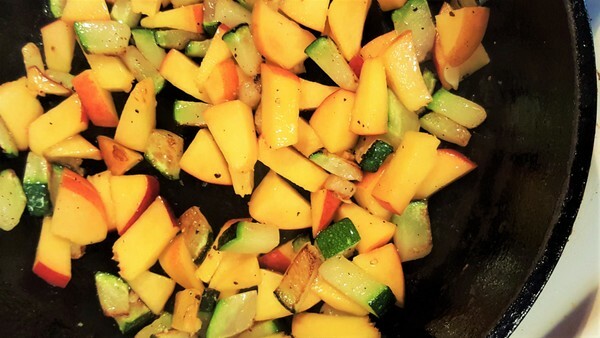 Once the oil is hot, toss in the zucchini. Make sure the pieces are in one even layer of the skillet. We want these pieces to get some good caramelization so don’t move the pieces around in the pan. Let the pan do its job and brown that zucchini. This will take 1-2 minutes. Once the time has elapsed, stir the zucchini around. 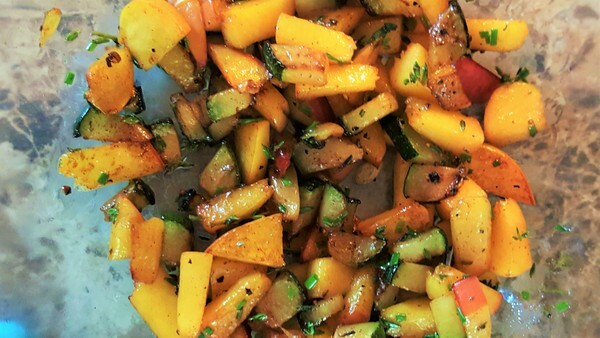 You should see golden brown bits all over your zucchini. Now that the filling is room temperature, it’s time to stuff those chops! Spoon about a ½ cup of the zucchini, peach mixture on the top third of the flattened pork loin chop. Crumble an ounce of goat cheese over the filling. Tightly roll the pork chop over the filling and continue until you have formed a tightly shaped log. Lay the log seam side down. 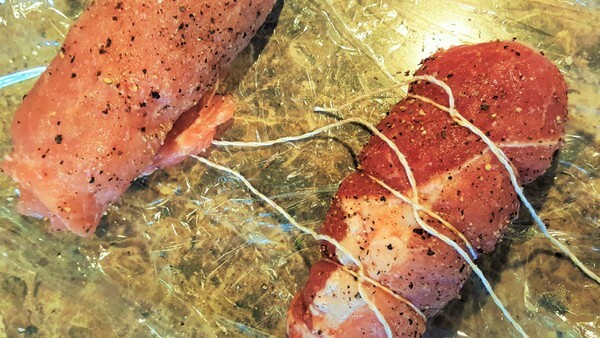 Tie each log with kitchen twine so that the pork holds its shape. Preheat the oven to 350 degrees. In an oven proof skillet over medium-high heat, sear each log on all sides to get a golden brown, caramelization on the outside. This will take 5-6 minutes. 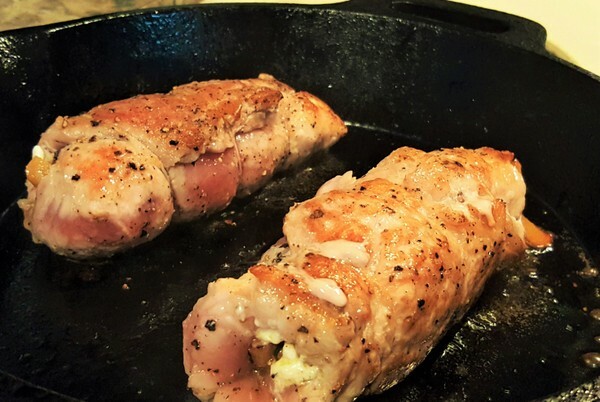 Once well seared, drizzle each log with a little Extra virgin olive oil and place the skillet with the pork roulades in the oven to roast for about 25 minutes or until a thermometer reads 160 degrees when inserted into the thickest part of the roulade. When ready, remove pork roulades from the oven and set on a cutting board covered in foil to rest and redistribute the juices. Place the skillet they were cooked in on the stove over medium heat. Deglaze the pan by adding ¾ cup of chicken stock and scraping up the little brown bits. Bring the stock to a boil then reduce to simmer for about 4 minutes till the stock is reduced by half. Remove skillet from the heat and add the juice of one lemon as well as the zest. Season with salt and pepper and stir to combine. Slice each roulade into 4 medallions and place upright on a clean plate. Spoon the pan sauce over the medallions. Just enough to dress them and add moisture. Serve alongside a heaping helping of mashed potatoes, and enjoy! You see at the time that I made these I was 8 months pregnant and in my attempt to be a good little planner I decided to make a double batch to freeze for a future meal after our new addition arrived. The not so good planner side of me thought I could accomplish the assembly during nap time right before a set appointment…approximate time to accomplish- 90 minutes. Now this seems like a reasonable amount of time right? YES- as long as everything goes according to plan without a hitch…let me just say, life was out to get me today. 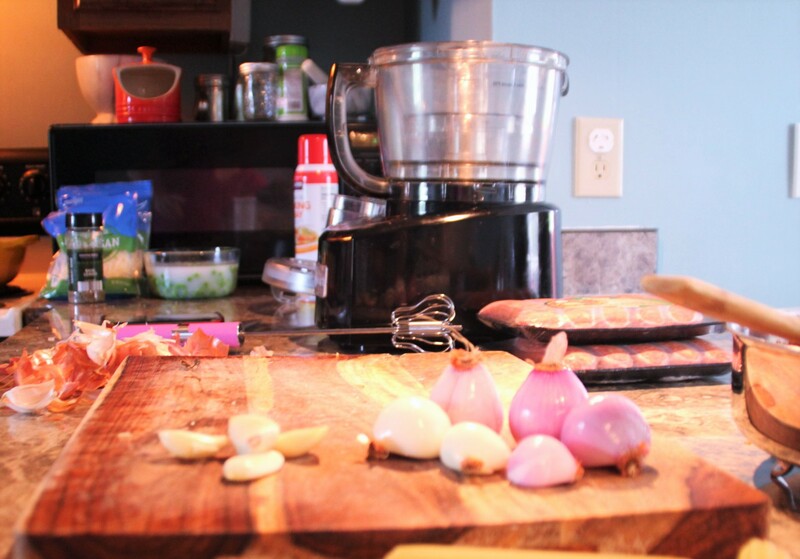 I started to prep my ingredients, which included a lot of chopping, defrosting, decasing, and par cooking. 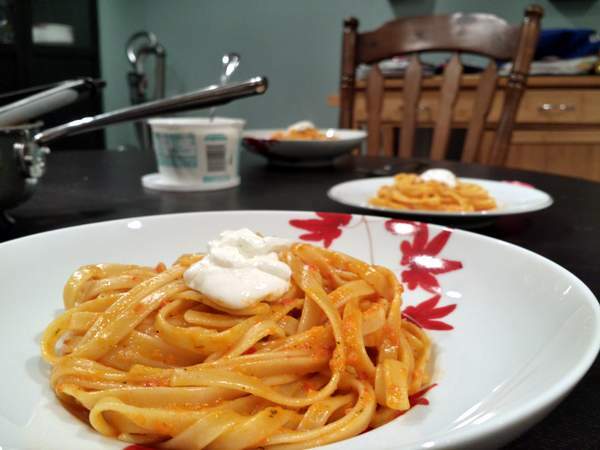 Marinara sauce was created and a delightful, cheesy béchamel sauce was whipped together with ease, no worries…and then things got crazy! When making a double batch make sure the pans you use are big enough to get the job done. Sauces were a go but I may have underestimated the size pan needed to create the filling. Sausage and peas flung everywhere as I carefully stir fried the meat and peas to get a nice, even caramelization. 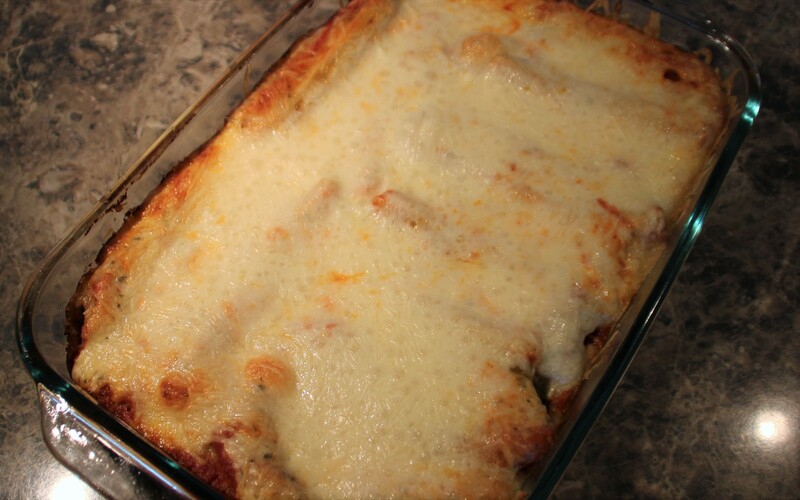 It was a hot mess- a delicious, mouth-watering mess scattered across the stove top, and then we had to stir in half of the béchamel sauce…oh boy! The next kitchen faux pas was boiling enough water to par cook the manicotti noodles appropriately. Let’s just say that I had masticated noodles due to the fact they stuck together as they waited to be filled in the strainer. I had to get creative because I was in too deep…these babies were going to be made one way or another, even if it killed me- which it almost did because wait till you read what happens next. As I am frantically trying to stuff the manicotti, time is slipping through my fingers and then I notice something is not right. You know that feeling you get before something is about to go horribly wrong, well the hairs on my neck went up as I felt the subtle breeze of a wasp dive bomb me from out of nowhere. HOW DID HE GET IN HERE?! I dodged left, I dodged right- my hands covered in sauce and sausage filling oozing out of my broken manicotti rubble, my heart beating a thousand beats per second because have I mentioned I am TERRIFIED of wasps!? Now call it pregnancy brain or irrational fear I reached for the only weapon I felt comfortable using to fight my foe…Wasp and hornet spray…you know the kind a pregnant woman is NOT supposed to handle due to the fact it could cause birth defects, let alone spray in the house at all…yea I sprayed all over the window and may have ruined my son’s favorite Thomas the train puzzle…sorry honey! The Brightside, my food was left unscathed and by the grace of God I was able to crawl across the finish line with a delightful assembly of Italian comfort food. Believe me, after the time I had putting this dish together, I needed all the comfort I could get. The sausage is rich, the peas taste fresh and the duo of marinara and béchamel sauces hug you inside and out like an Italian Grandma. This dish does take time to assemble, but the results are well worth the effort. We ALL have our days in the kitchen, and this dish was one of them. But if I could pull myself together and get dinner on the table despite my disadvantages – you can too! Just be sure to use a fly swatter instead of the spray…way less hazardous! Prep a 9x 13 inch pan with vegetable oil cooking spray and set aside. 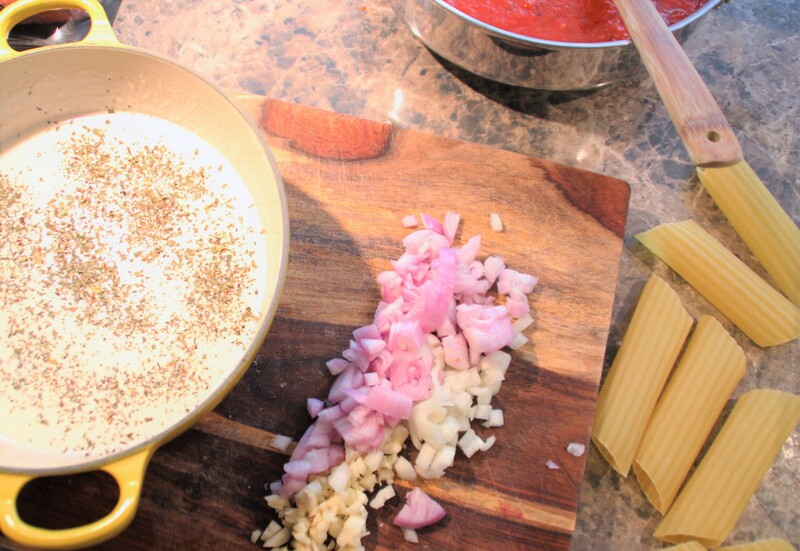 Prep the Fonduta sauce by bringing the milk and cream to a simmer in a medium sauce pan over medium heat. Once it has reached a simmer, reduce the heat to low and stir in the Pecorino Romano cheese until it has melted and the sauce is smooth. Take the pan off of the heat, stir in the basil and set aside. Prep the filling using a large skillet heat 2 tablespoons of olive oil over medium high heat. Add the sausage, shallot, garlic ¼ tsp salt and ¼ tsp pepper. 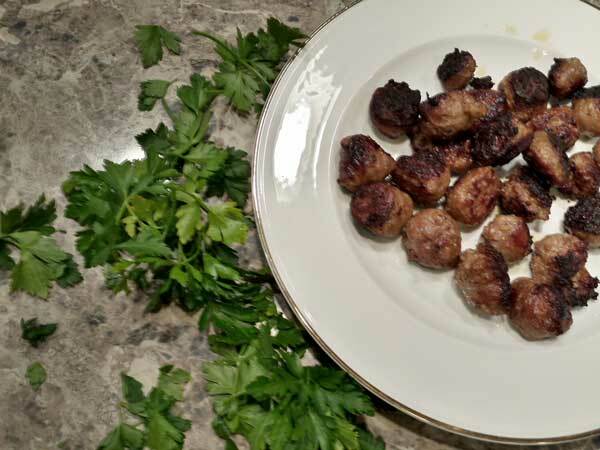 Be sure to break up the sausage meat in the pan allowing the mixture to cook for about 8 to 10 minutes until cooked through and broken down to about ½ inch pieces. Increase the heat to high, pour in your white wine and scrape the bottom of the skillet to release the brown bits that have cooked on the bottom of the pan. Cook till the wine is evaporated, about 2 minutes then remove pan from the heat. 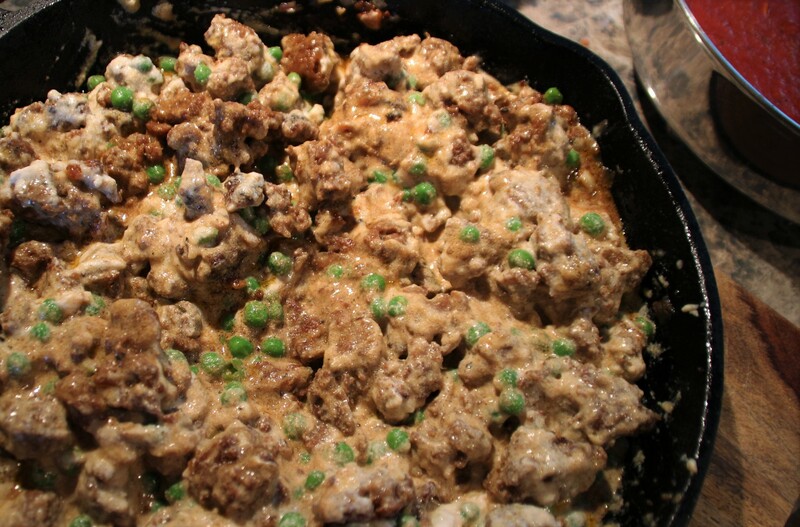 Allow to cool slightly, then you can stir in your peas, ricotta and 1 cup of the fonduta sauce. Season with ½ tsp salt and ¼ tsp pepper. 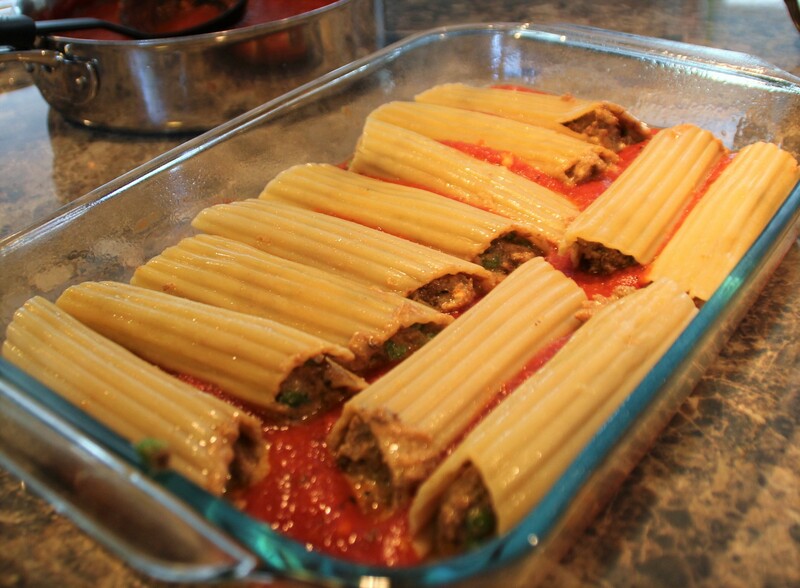 Prep your manicotti shells by bringing a large pot of salted water to a boil over high heat. Add the pasta and cook until just tender (about 7 or 8 minutes). Drain and set aside. 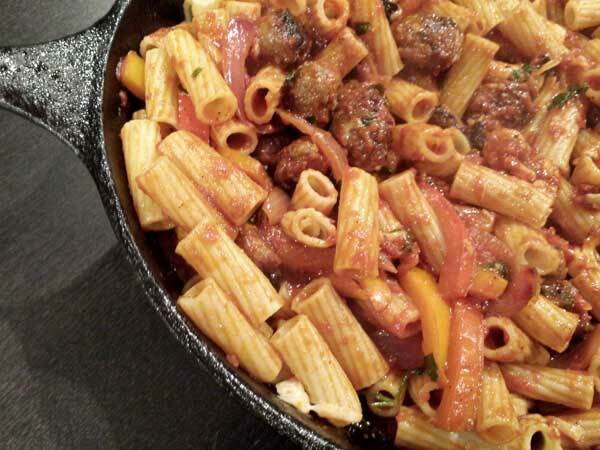 Assemble your dish by ladling half of the marinara sauce over the bottom of your 9x13 pan. Using a spoon, stuff each manicotti shell with your sausage mixture and arrange in the pan so that all 12 fit in a single layer. 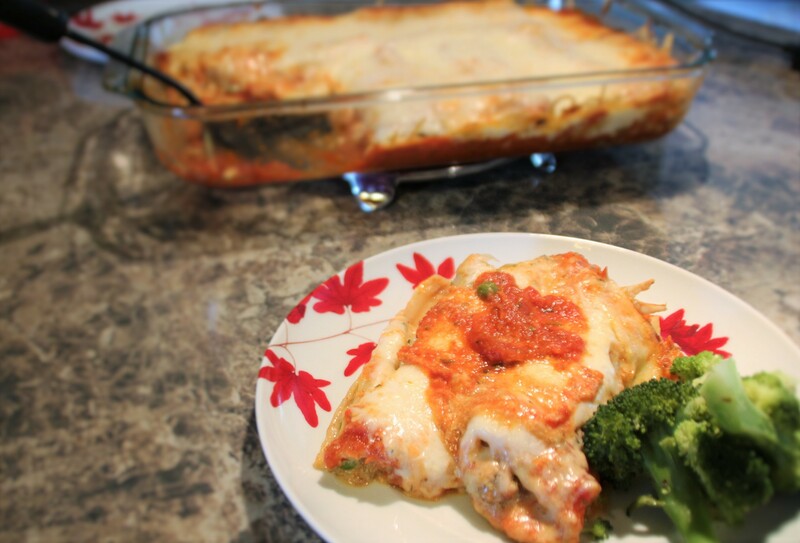 Pour the remaining marinara sauce over the top of the stuffed manicotti shells. 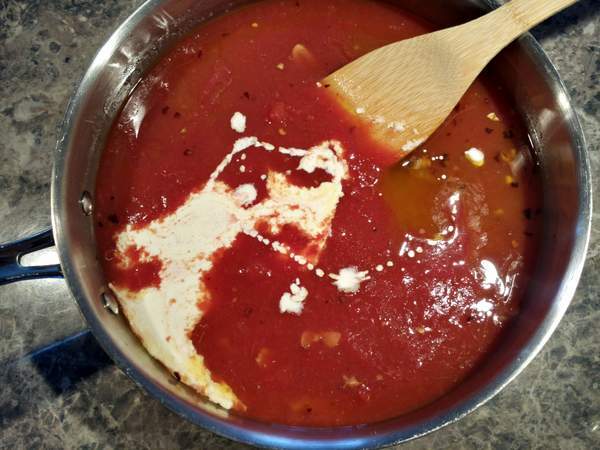 Top the marinara with the rest of your fonduta sauce and sprinkle the top with the mozzarella cheese. Drizzle with olive oil and bake in the oven for about 30 to 35 minutes until it bubbly and the top is golden brown. ** You can also freeze the assembled dish for a later date. Just cook the dish from its frozen state in a 400 degree oven for about 1 -1.5 hours till it’s bubbly and golden brown. 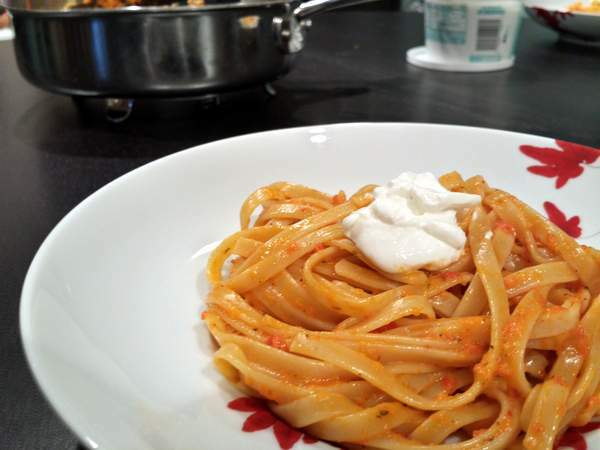 50 Pastas – Vodka Sauce Pasta in VODKA Sauce…need I say more?! Well if you insist, I will elaborate… Imagine a sauce, a rich, creamy sauce spiked with a little “somethin’- somethin’” to crank any dinner party into high gear…this is THAT SAUCE! The taste is soulful… smooth, like your favorite song just came on the radio during the “Friday Free For All” hour where ANYTHING can happen…and it’s about to get a little rowdy up in here! So get ready to get down with this saucy dish…special equipment includes- a glass of wine, a boombox, and a CD loaded with the music that gets you groovin’…cuz we’re gonna turn it up to 11… This sauce is akin to my Marinara sauce, which is awesome! Think of it as a base that we’re about to jack up with some cream and vodka…this is how we do! 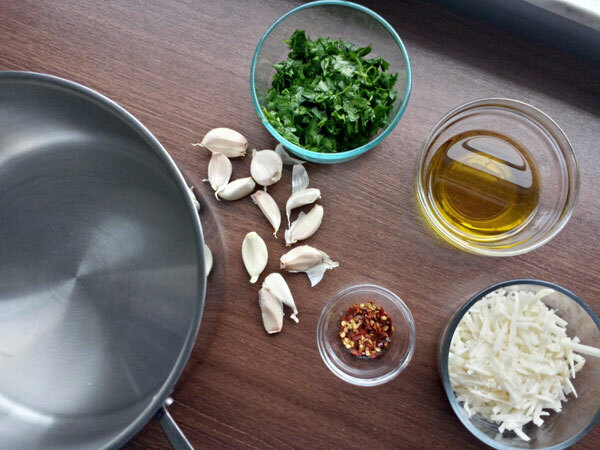 In a large skillet over medium heat, cook garlic slices in olive oil until golden brown. 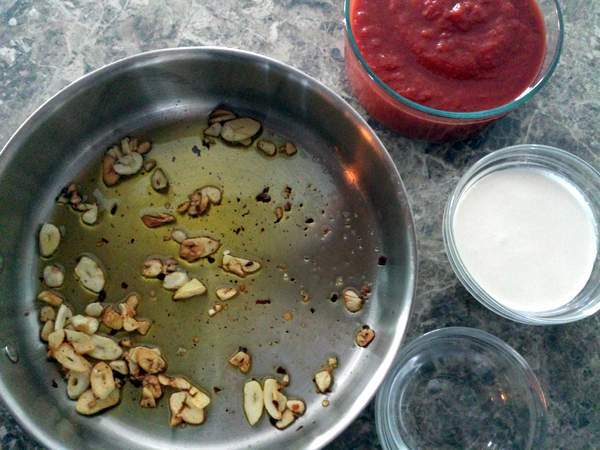 Sprinkle the toasted garlic with red pepper flakes to your liking. This will add a nice kick of heat to the infused oil which will penetrate the sauce as we add ingredients. Stir in some vodka and hear your pan come alive. The party has arrived and it’s ready to get down with some crushed tomatoes! “Er’body in the pan get tipsy!” Now the beat is about to drop as we bring this party home with some crushed tomatoes and a little basil for some… FLAVAH! Stir in some cream to smooth things out and simmer this mix for a couple of rounds! 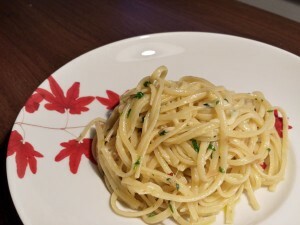 When the mood feels right, toss in some cooked penne or spaghetti and let the good vibes flow through this dish you’ve created you CRAZY DJ of FOOD! Phew…what a rush?! Time to take things “Nice n’ easy” and enjoy the fruits of our labor…Cheers to you! By the way…I’m always looking to expand my kitchen play list….what’s your favorite song that gets you grooving? Let me know in the comments below! 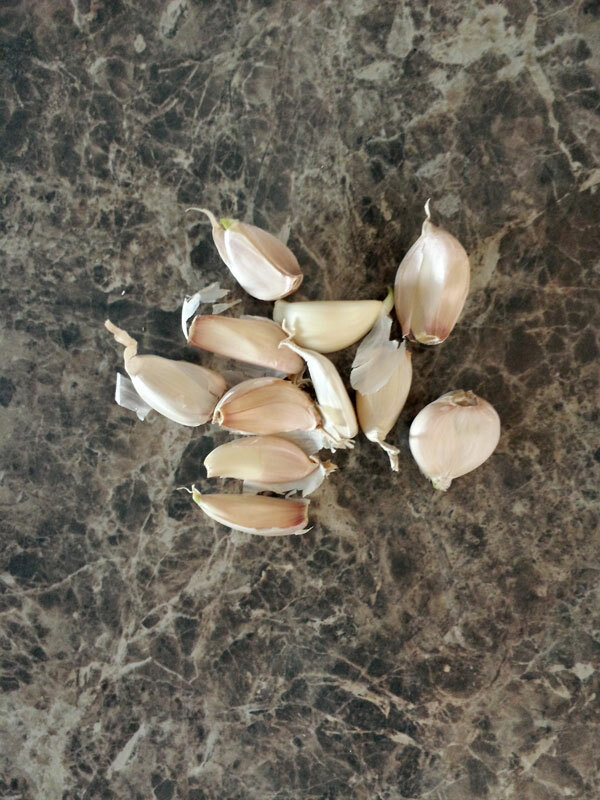 Cook the garlic slices in some olive oil over medium heat until golden brown. 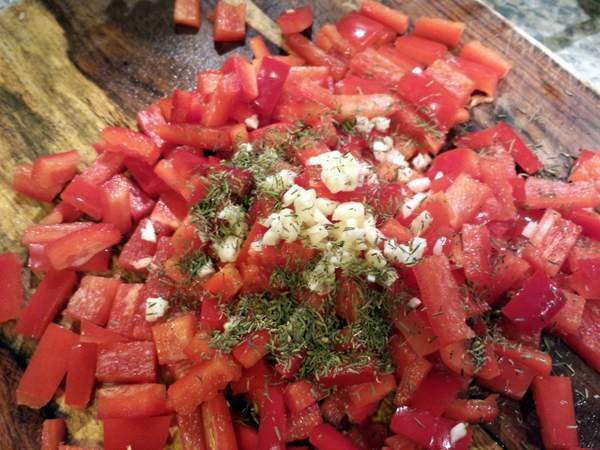 Sprinkle the garlic with red pepper flakes to taste. Add in the vodka and allow to simmer with garlic for about 30 seconds. Stir in the tomatoes, water and cream and allow the mixture to come to a simmer. If using dried basil, stir in now and allow the sauce to simmer for 15 minutes. 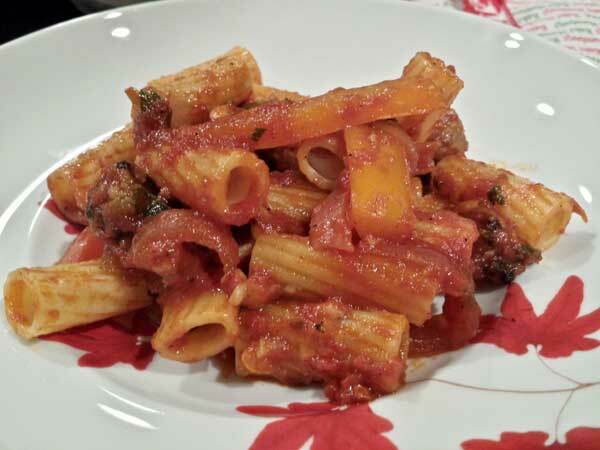 If using fresh basil, stir in after the sauce has simmered for 15 minutes. 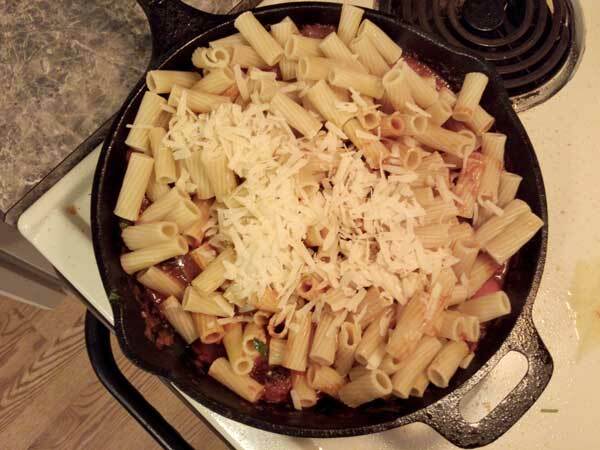 Toss in some cooked penne or spaghetti and garnish with Parmesan cheese. Indulge! In case you were curious….yes, I live with an opinionated toddler. Daily I am intrigued by the logic he juggles in that massive brain of his determining what he likes and dislikes…mom’s do you feel me? I seriously think he spends half of his nap time thinking up mind games he can play on Mommy to make his evening more “eventful”….there’s not enough wine in the world some nights…OY! Recently, my son has decided he does not like the taste of Red Bell Peppers….WHAT?! What’s not to like?…they’re crunchy, they’re sweet, they’re juicy…need I go on? 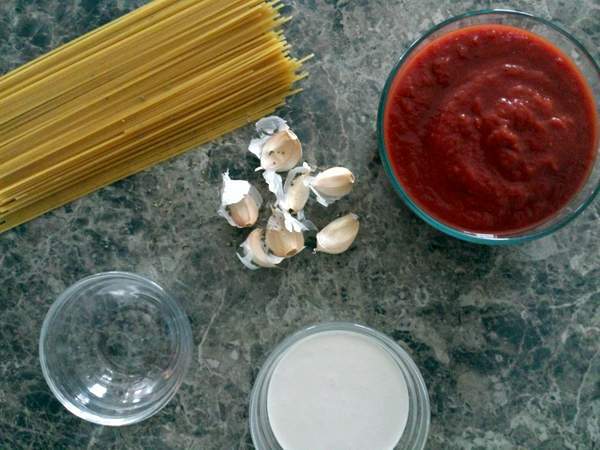 Mom’s unite…let’s prove their taste buds wrong with this delightful pasta sauce, shall we? The red bell peppers and garlic are broken down into bite sized pieces…all the better to cook you with my dears! Toss them into a pan over medium-low heat with some butter and thyme. Cover and cook until nice and tender. This is when the synapses in your brain begin to fire as you realize this intoxicating smell is about to fill your belly with comfort and love…it’s divine! 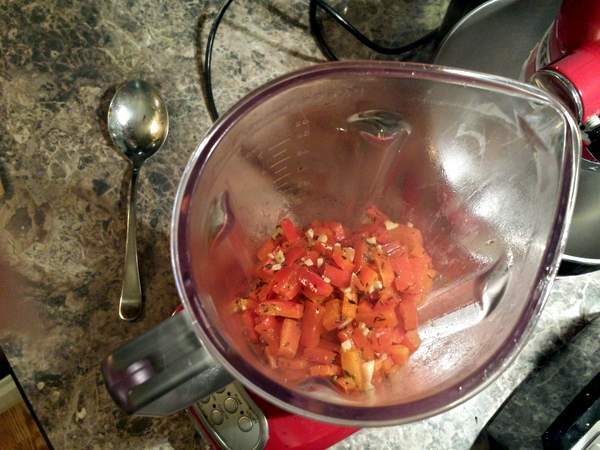 Now it’s time to puree the heck out of these tenderized vegetables….almost like a red pepper smoothie, but we won’t slurp this down just yet. We need to add a few extra ingredients to enhance the flavors being created at the moment. Return the pepper puree back into the skillet used before, turn up the heat to medium and stir in a squeeze of lemon juice. Never underestimate the power of a good lemon squeeze…it has a way of awakening the flavors you are blending and making them happy to please your palate. Don’t be stingy…just do it! 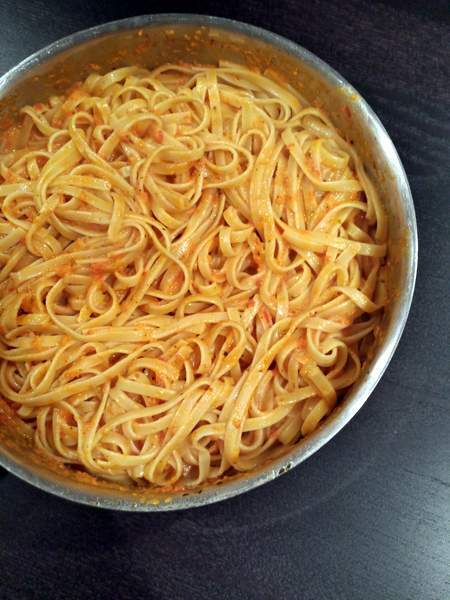 Simmer the pepper sauce until it is thickened then toss in some cooked noodles…like tagliatelle or fettuccine. I would say any long, string-like noodle would go great with this sauce. I especially liked the long flatter noodles with this allowing more surface area for the sauce to grab on to. Season with some salt to taste and garnish with a dollop of sour cream when ready to serve. All I am going to say is, my son’s plate…EMPTY! Yea that’s right Little Lew…who’s yo momma now?! Time to tackle the next challenge…how to rekindle his love for eggs…If you’ve got a suggestion, let me know in the comments below! Or if you want to say “Hi There!” that would be cool too! In a skillet over medium-low heat melt the butter and cook the peppers, garlic and thyme covered until tender. Transfer the mixture to a blender or food processer and puree until smooth. Return the pepper puree back to the skillet. Turn up the heat to Medium and stir in some lemon juice. Simmer until thickened. Toss in some cooked tagliatelle (or fettuccine). Season with salt and top with a dollop of sour cream. …ok let’s do this thing! 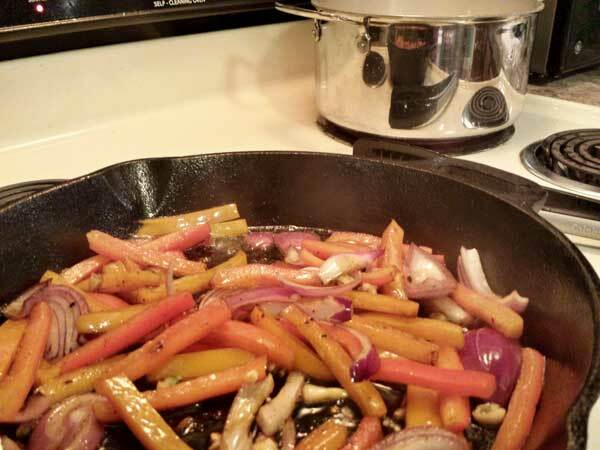 While the oven is preheating to 400 degrees go ahead and toss your carrots with some olive oil, salt and pepper. Next thing I want you to do is sprinkle the zest of one orange and douse the entire mixture with its juice. 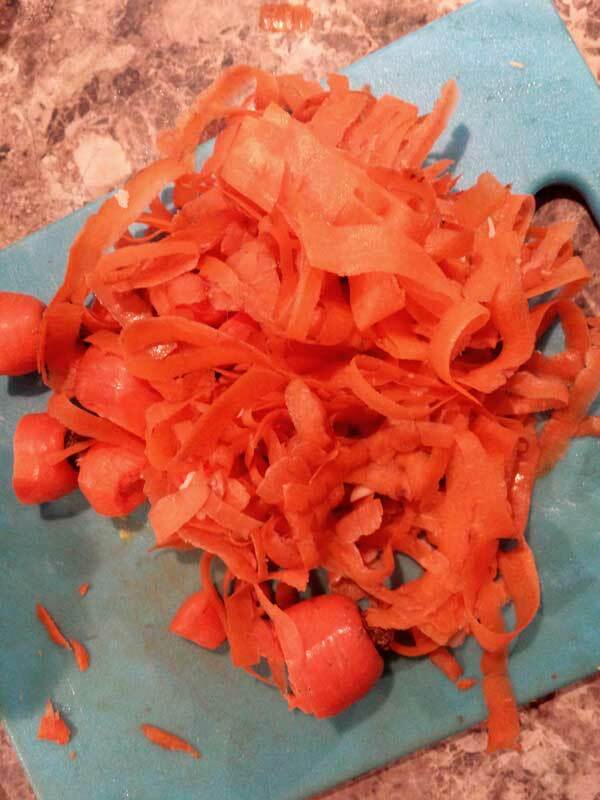 Orange and carrots were meant for each other…oh and ginger too! Speaking of which, go ahead and pour the carrot mixture into an oven proof skillet and pour in some ginger ale. Believe me friends, I had no idea what I was getting myself into, but once I experienced the smell and flavors of this dish I knew it was going to be life changing. Place the skillet in the oven and cook until fork tender. The glaze will reduce and the carrots vibrant color will begin to tempt you to devour the pan. Trust me…let it mellow for a bit so you don’t scald your poor taste buds…plus we have an outrageous topping to garnish this side that you would regret missing. 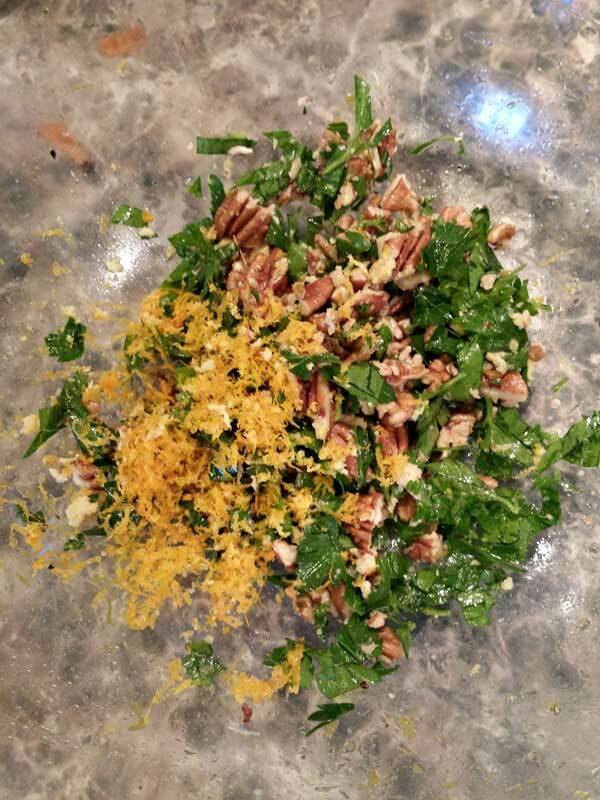 In a separate bowl mix together, the juice and zest of another orange, grated ginger, chopped toasted pecans and chopped parsley. Season generously with salt and pepper then sprinkle the topping over the gingery carrots! Paired with the Pea Pesto Pasta, this dish will have others kissing the ground you walk on because you have a child who will actually eat vegetables and like them! Well maybe not…but you are the queen of your kitchen and nobody can touch you…especially with this recipe in your arsenal! 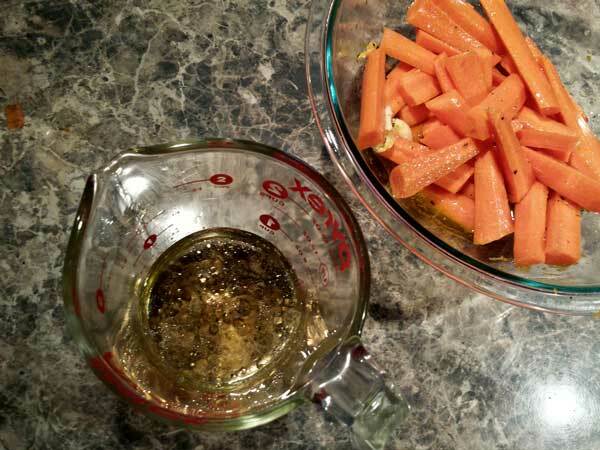 Toss the carrots in the olive oil seasoning with salt and pepper to taste. 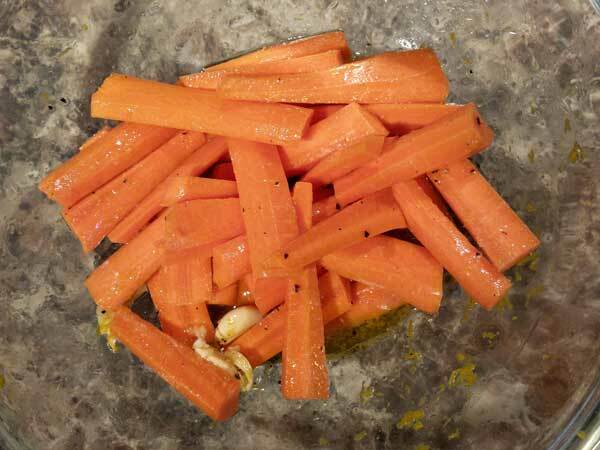 Douse the carrots with the zest and juice of one of the oranges and toss in the smashed garlic. Heat a large oven proof sauté pan over medium high heat. Arrange the carrots in one even layer in the pan, pour in the ginger ale and cook the carrots on the stove top till they start to color. Transfer the pan to the oven and allow to cook for about 10-15 minutes. The glaze will reduce and the carrots will become fork tender- that is how you will know they are done. Remove them from the oven and set aside to cool slightly while you make the topping. 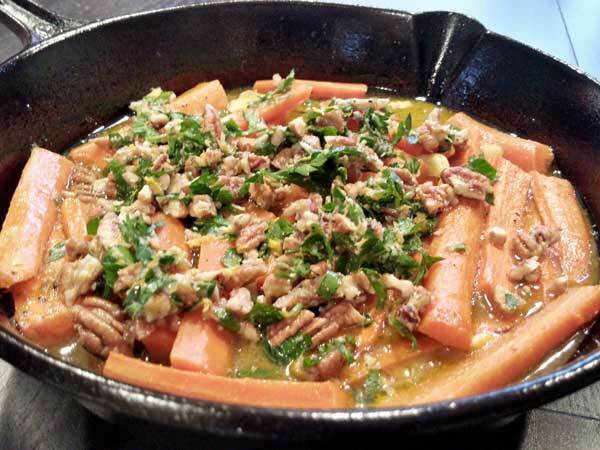 In a small bowl mix together the pecans, remaining orange zest and juice, ginger and parsley. Season generously with salt and pepper then sprinkle the mixture all over the carrots. Delish!